I had my second child, a baby girl just eight weeks ago. It's an incredibly joyful time in my home, but also kind of chaotic and stressful. With my first child, my home was relatively serene during my three month maternity leave. This time around, between caring for my three year old, ferrying him to and from school, both nursing and pumping for the baby, running my own business (what maternity leave? ), and helping my husband with his business, I feel like my overtired mind rarely gets a chance to rest. I've known about the benefits of meditation for years -- it can help reduce stress, increase focus and improve sleep. I even dabbled in meditation to help combat pregnancy insomnia, but I've always been too intimidated to give it a real go. 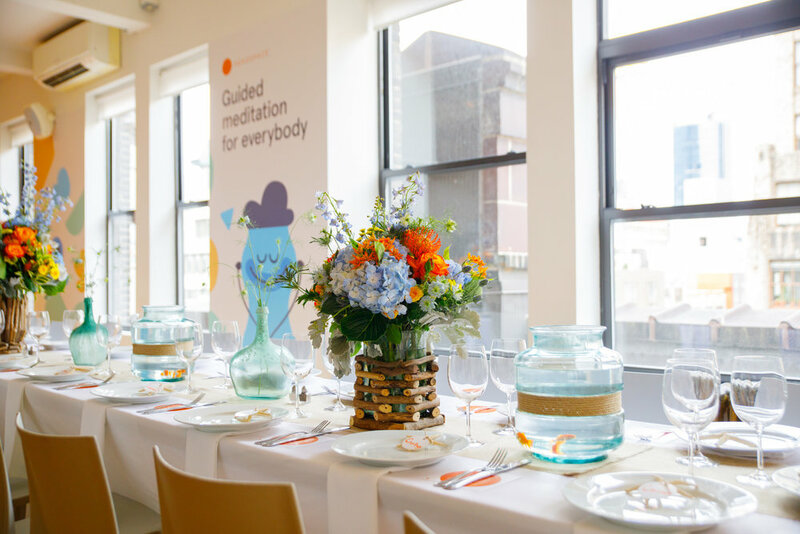 That's why I was incredibly excited when Momtrends invited me to an interactive luncheon and meditation with Headspace, the Mindful Meditation App. This post was sponsored by Momtrends and Headspace, all opinions are my own. Start your mindfulness journey today by using this link to sign up for 40% off the Headspace app (more detailed instructions can be found below). Before agreeing to attend (which would mean parting with my baby for a few hours), I checked out the Headspace app. I found it to be easy to use and totally accessible -- with guided meditations as short as three minutes and some playful and insightful animations. More research revealed a few compelling facts. First, the co-founder and voice behind the app, Andy Puddicombe, is a former buddhist monk. Second, there is published research showing that Headspace is effective. Third, when I searched an incredibly active Facebook mom group for meditation, I found Headspace recommended more than any other meditation app. Fourth, the app includes meditations specifically designed for kids as young as three. Here is a recap of the event, as well as my own thoughts on the event and app. 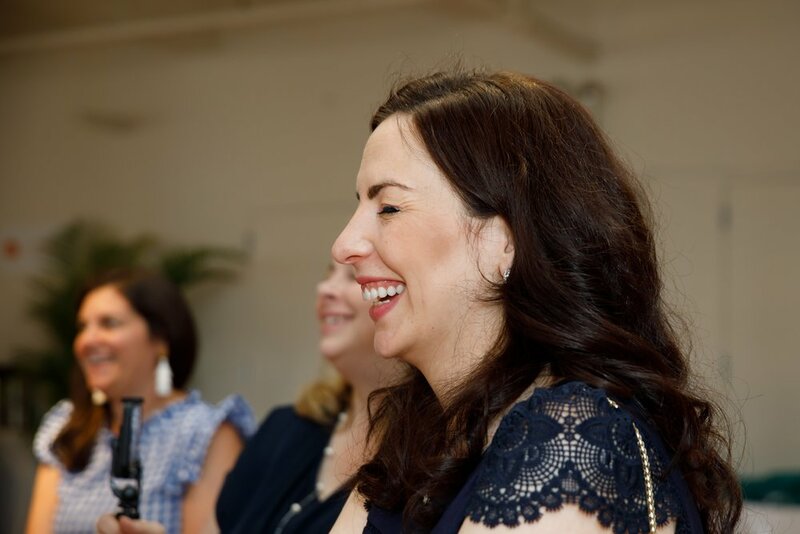 Momtrends always throws great events. This one had a light and cheerful vibe, that really aligned with the aesthetic and feel of the app. 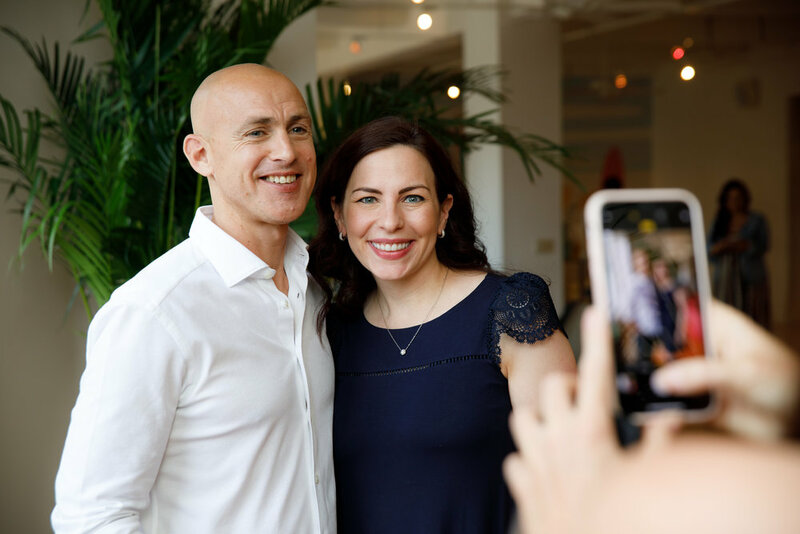 We sat down for a wonderful lunch and heard from Nicole Feliciano the founder of Momtrends, Andy Puddicombe the co-founder of Headspace, and a member of the Headspace science team. Finally, all of us bloggers put away our phones for a full five minutes (can you believe it?) and did a meditation guided by Andy. Nicole shared the results of a nationwide "Parenting Stressor Survey" conducted this spring by Momtrends Media. 40% of respondents identified summer as their most stressful time of year, followed by back to school (22%) and holiday season (22%). The four most common reported leading causes of summer stress were change in routine (40%), too many activities (19%), fear of brain drain (15%) and arranging childcare (12%). The large majority of parents noted that the reason summer is stressful for their kids is due to either change in routine (46%) or boredom (34%). Finally, the survey revealed that what parents want most for their families this summer is to spend more quality time together (37%) and to start a new family tradition (17%). Next, Andy gave us some tips on how to reduce summer stress while spending more quality family time and starting a new tradition. Before, I get into his tips, I have to share that Andy and his story are pretty fascinating. In short he is a British guy who has traveled the world and was ordained as a Tibetan Buddhist monk in Northern India before launching Headspace. Andy suggests that parents try to be "mindful" and appreciate the present moment with their families. He offered these simple approaches to enhancing your family's time together. Meditation has existed for generations, and now the science backing it up is catching up! Meditation can reduce stress, anxiety and anger, while increasing focus, compassion and happiness. Even short meditations can add a sense of peace, balance and togetherness to your household. Andy recommended setting a time for meditation at the start or end of the day and remarked that kids as young as 3.5 really benefit from meditation. 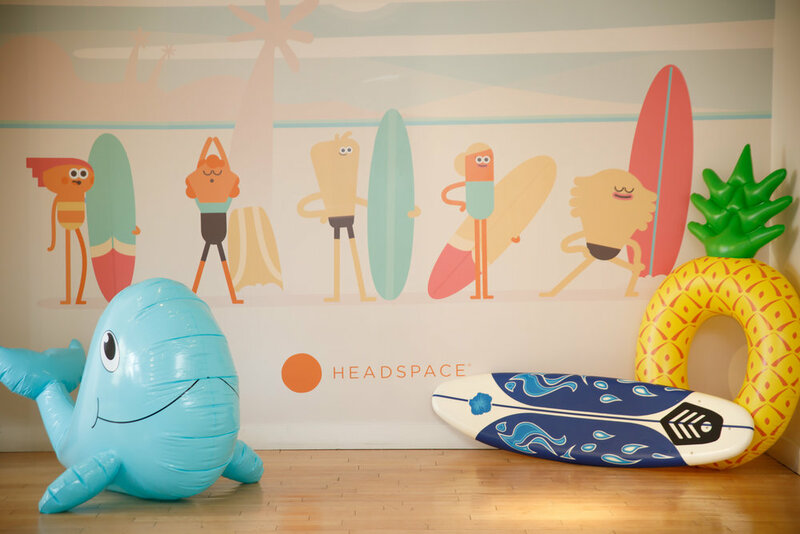 Since attending the event, I've been doing Headspace kid meditations with my 3.25 year old most evenings and about once a day when he needs my attention while I'm busy feeding the baby. He definitely enjoys it. We started with one minute long meditations and are making our way up to three minute meditations. He definitely gets it to some degree and it calms him down, plus hearing a three year old ask for a meditation is one of the cutest things ever! This sounds like a no-brainer, but can be hard to implement -- especially for a family like mine that doesn't all eat on the same schedule on weeknights and has the distractions of an infant. Andy suggests that the family starts by committing to a 100% device free dinner at least weekly, with a focus on conversation (beyond mono-syllabic answers). He also recommends trying a device-free game night once a week. During my pregnancy I already made daily device-free "special time" with my son a priority so I feel like we are on the right track (look out for my upcoming blog post on preventing sibling jealousy with the arrival of a new baby). I can definitely do more in this realm. Andy recommended a game-like activity that goes beyond what is actually on your child's plate to help them develop a healthier relationship with our food and environment. Ask your child where the food on their plate comes from, where it was grown, and how it got to your home. Next have them tell about the shape, texture, ingredients and what the smell is reminiscent of. Finally, ask them about the experience of eating the food -- including calling out its flavors. This activity is for the parents. Andy recommends creating a summer gratitude journal in which you write down something that you appreciate about your child each evening. It can be something they did or a characteristic that you admire. Give it to your child at the end of the summer. The benefits are two-fold -- your child will treasure it (if not now, then when they are older), and the process of writing down what you are grateful for has been shown to aid sleep. This one is for the whole family. Pressure can build quickly, especially with kids. When you feel things going in the direction of spiraling out of control, take 30 seconds to just breathe. Just ten deep breaths, in through the nose and out through the mouth, can reset the entire family dynamic. For kids, this can mean directing them to a special decompression spot in the home. Meltdowns, fights and lashing out in the home are often a reaction to something else going on. A short breathing exercise can diffuse the situation, give us broader perspective, and help us avoid the regret and guilty feeling that often follows us lashing out at our kids. At the event, we all sat down for a 5 minute mediation guided by Andy (who is also the voice of all the meditations in the app). Even those in the group who had never meditated said that they felt better after the mediation. Mediation is, however, a skill. It takes consistent practice to get comfortable. The Headspace app offers meditations as short as one minute and a basics pack to ease you into your journey. The beauty of the app is in its simplicity (though some would argue that it's in Andy's voice), it's so easy to jump right in and get started. I've done the basics pack and a meditation to help me fall back asleep after my middle of the night feeds. My life is still chaotic, but the app is definitely helping to clear my mind (at least until the next baby cry or toddler call of "I need help" coming from the bathroom)! My son is enjoying the children's meditation and is envious that I met Andy. I'm still at the very start of my mindfulness journey, but am hopeful that using the app and applying Andy's tips will improve the quality of our family together time this summer! Register by clicking here. Once you log into the app on your phone, it will automatically connect to the subscription you just activated. I hope that you will join me on my meditation journey! Click here to get started. Photos in this post are property of Momtrends.